Wendy's U.S. sales totaled $8.5 billion last year. NEW YORK (CNNMoney) -- Wendy's is taking a bite out of Burger King in the fast food business. Dave Thomas's restaurants became the No. 2-selling hamburger chain in the country last year, industry research firm Technomic said Monday, pushing Burger King back to the No. 3 spot. Burger King had been No. 2 spot since at least 1972, the earliest year for which Technomic has data. 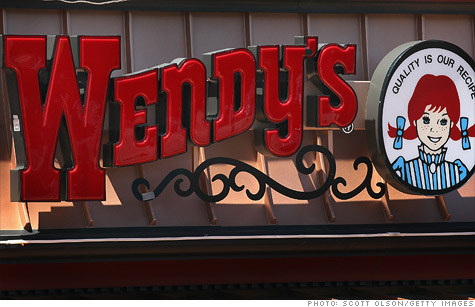 Wendy's (WEN) U.S. sales totaled $8.5 billion last year, edging out Burger King and its $8.4 billion. Wendy's has roughly 5,900 locations in the U.S. compared with Burger King's 7,200. Five Guys Burgers and Fries ranked as the fastest-growing chain in the U.S. last year, Technomic said, followed by Chipotle Mexican Grill (CMG) and Jimmy John's Gourmet Sandwich Shop.